An explosive device has caused minor damage to a military recruitment centre on New York City's Times Square. 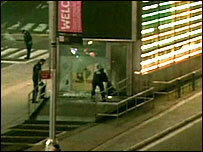 The centre was empty and no-one was injured in the pre-dawn blast, which smashed a glass window. White House spokeswoman Dana Perino said the bombing did not appear to be an act of terrorism but the investigation was in its early stages. New York Mayor Michael Bloomberg said the attack on the recruiting office was an insult to US forces personnel. "The fact that this appears deliberately targeted at the recruiting station insults every one of our brave men and women in uniform stationed around the world," Mr Bloomberg said at a news conference. He said New Yorkers would not be intimidated. "New York City is back and is open for business... People are going about their business, shopping, working and sightseeing." New York City Police Commissioner Ray Kelly said a witness saw a person on a bicycle wearing a backpack and acting suspiciously shortly before the blast. Mr Kelly said the bomb was in a military ammunition case and was "not particularly sophisticated". After the explosion in the early hours of Thursday, police cars blocked nearby streets as the bomb squad gathered evidence. The centre is on a traffic island in the middle of the square and is surrounded by streets, theatres and restaurants. The recruiting station is one of the busiest in the US and has occasionally been the site of anti-war protests. Witnesses staying at a Times Square hotel told the Associated Press news agency that they heard a "big bang" and could feel the building shake. A plume of smoke was also visible after the explosion, they said. At one point, subway trains passed through Times Square station without stopping but normal service later resumed.